Dozens of communities across Victoria remain under threat from floodwaters as weary State Emergency Service crews battle to get on top of hundreds of calls to repair storm-damaged houses after a wild weekend of weather. The worst effects of the heaviest floods in Victoria in more than 15 years are yet to be felt, with hundreds more homes expected to be inundated. The rain eased on Sunday after falls of up to 200mm but the state of emergency remains, with floodwaters yet to peak. The cost of the floods will be in the millions of dollars and massive areas have been, and will be, affected, with floodwaters peaking near Benalla and Wangaratta in the northeast but yet to peak in the Goulburn River in the north, the Wimmera River in the west and the Mitchell and Macalister rivers in Gippsland. More than 250 homes had been evacuated in the northeast by Sunday night, including in Euroa, Benalla, Myrtleford, Bright and Jamieson. SES volunteers were doorknocking parts of Bairnsdale, about 280km east of Melbourne, late on Sunday, where flooding threatened to inundate about 50 homes. Severe winds lashed Victoria's west coast and Melbourne's bayside suburbs on Saturday night causing trees to fall and damaging buildings. By 10.30pm (AEST) on Sunday, the SES had more than 600 emergency calls outstanding across metropolitan Melbourne, state controller Stephen Warren said. "The volunteers got hammered (on Sunday) because of the thousands of jobs they had," he said. "Obviously we're asking people to be patient because we're dealing with thousands of calls through the floods, and the wind storm hitting Melbourne put a bit of pressure on us overnight. "We've got some still outstanding. We've assessed the priority jobs but some of them until Monday because the volunteers have been flat out for a couple of days and there is only so much they can do." Towns near the Mitchell and Macalister rivers in the east, especially those below the dam at Lake Glenmaggie, remain threatened by floods and could be left isolated by road closures. Authorities are warning residents north of Wangaratta to boil for at least three minutes any water they use as their supply could come from the Ovens River, where floods have caused the sewerage system to leak into the river north of Wangaratta. More rain is forecast later in the week, although not as heavy, with up to 30mm expected. But it could cause extra flooding because of the weekend's events making the ground wet. "Some of the rivers have peaked. Some are still coming up," Mr Warren said. "The rain has eased off a little bit. Hopefully the levels will steady a little bit more now and we can get an idea of what the effects will be downstream in the next couple of days. "But this operation will be going for a while before we see all this water out of the state." Minor to moderate flood warnings remain in place for a host of streams including the Mitchell, Macalister, Yarra, Maribyrnong, Werribee, Barwon, Glenelg, Mitta Mitta, Ovens, King, Broke,. Goulburn, Loddon, Campaspe, Avoca, Wimmera and Murray Rivers. 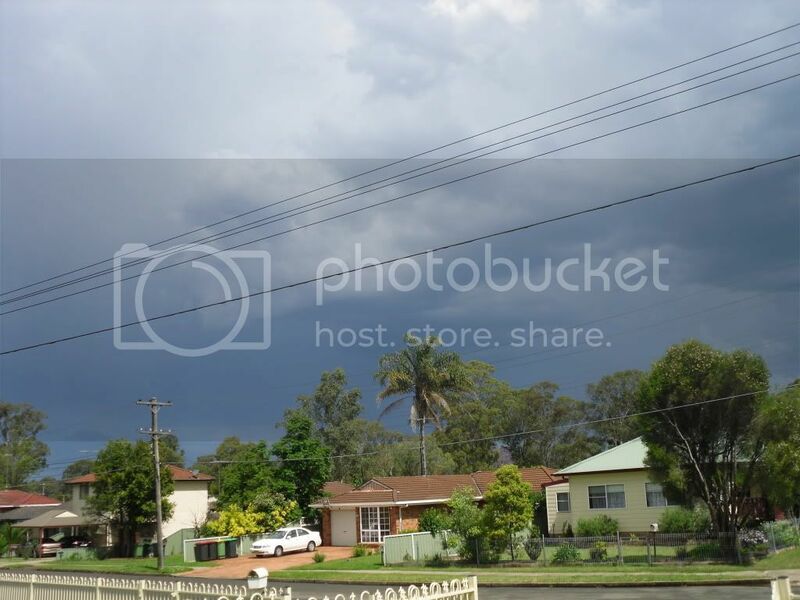 The Bureau of Meteorology has issued a severe thunderstorm warning for Sydney and coastal NSW. Heavy rainfall, large hailstones, flash flooding and damaging winds are likely to reach the Sydney central business district by 4.30pm (AEDT) on Monday before travelling out to sea, it said. A second set of storm cells are developing in the southwest of Sydney and are expected to strike the city and surrounding areas later on Monday. The State Emergency Service (SES) said it had already responded to two calls for assistance by 3.30pm. "We are asking people to park their cars undercover and bring children and pets indoors ahead of the storms," SES spokesman Phil Campbell said. Thunderstorms are also predicted to hit NSW on Tuesday and Wednesday, but the bureau warns Monday's are likely to be the most dangerous. "Today we have ideal conditions for severe thunder storms," bureau forecaster Dmitriy Danchuk said. The SES is advising householders to tie down any loose items outdoors ahead of the predicted damaging winds. It's also advising people to turn off phones, computers and other appliances during the storm. Other areas expected to be affected include Sydney Airport, Sutherland, Campbelltown and Kiama. "If people find there are downed powerlines or damage to their property, stay well away from that and call emergency services," Mr Campbell said. Yeah. We just copped it here in South West Sydney. So heavy it flooded down the back of the yard a bit. I had a few interesting moments ... but the weather radar showed most of it was south of here - with only a few pockets passing overhead and one brief dump of hail. Liverpool, Camden, Bankstown and out to the coast copped some heavy rain, some of it being significant patches of black - which is the heaviest rainfall that the weather radar is calibrated to show - as well as large areas of red and orange .. which represent some pretty heavy rain. Queenslanders have been told to prepare themselves for a terrifying 24 hours as the "most catastrophic storm ever" takes aim at heavily populated areas of the state's north. Severe Tropical Cyclone Yasi was upgraded to category five this morning as the weather bureau warned it was likely to be "more life-threatening" than any storm seen in Australia in living memory. Tens of thousands of people are fleeing their homes ahead of the monster storm, which is expected to hit the coast between Cairns and Innisfail with winds of up to 295 kilometres per hour near the core. Premier Anna Bligh says the storm's expected landfall at about 10:00pm AEST is the worst possible news for a state which is already reeling from recent flooding. She says Cyclone Yasi is the "most catastrophic storm to ever hit our coast". "Frankly, I don't think Australia has ever seen a storm of this intensity in an area as populated as this stretch of our coast," she said. "Whether it's cyclonic devastating winds, storm surge, or torrential rain further west as a result of this, we are facing an extreme event that will not be over in 24 hours, but will possibly take several days before the full flooding effect is felt across the region as well, potentially right through to Mount Isa. "We are facing a storm of catastrophic proportions in a highly populated area. You've heard all of the statistics and what it all adds up to is a very, very frightening time for people and their families. "This is not something that passes over the coast and is over in an hour. This is 24 hours of quite terrifying winds, anywhere up to 300 kilometres per hour, torrential rain, likely loss of electricity and mobile communications. People really need to be preparing themselves mentally as much as anything else." The weather bureau says Cyclone Yasi poses an "extremely serious threat" to life and property within the warning area, especially between Port Douglas and Townsville. "This impact is likely to be more life-threatening than any experienced during recent generations," the Bureau of Meteorology (BOM) said. This morning, Cyclone Yasi was estimated to be 650 kilometres east north-east of Cairns and 650 kilometres north-east of Townsville, moving west south-west at 30 kilometres per hour. The bureau says the low category five cyclone will continue to move in a west-south-westerly direction today, but could become a high category five before making landfall. Senior bureau forecaster Gordon Banks says it could take at least 24 hours for Cyclone Yasi to weaken after it crosses the coast. "There's still potential for it to become stronger ... as a strong category five we could see wind gusts in excess of 320 kilometres an hour, which is just horrific." He added: "If you're bunkering down in the regions it's going to be quite frightening and it's going to go on and on for quite some time." The storm's size and power dwarfs Cyclone Tracy, which hit Darwin in 1974, killing 71 people. A cyclone warning is current for island and coastal areas from Cape Melville and Sarina, extending inland to Croydon and Hughenden. The bureau says damaging winds with gusts up to 90kph are expected to develop on coastal islands later this morning, then extend onto the coast during the day, and further inland across the northern tropical interior overnight. Between Cooktown and Ingham these winds will become destructive with gusts in excess of 125kph during the afternoon and very destructive with gusts above 280kph between Port Douglas and Cardwell during the evening as the cyclone approaches. The very destructive winds can also occur on the seaward side of hills to the north of the cyclone and are also forecast to reach the Atherton Tablelands. A cyclone watch is current for coastal areas from the remaining tropical interior east of Camooweal and north of Winton. The weather bureau says the threat of a storm surge is also a serious concern with Cyclone Yasi coinciding with the high tide. Destructive winds will cause damaging waves, flooding and dangerously strong currents. Mr Banks says Yasi is moving quicker than expected. "We have brought forward the time of a potential coastal crossing and now it unfortunately coincides with the high tide in that coastal area," he said. "So certainly we would expect to see reasonably widespread inundation in the run-up to that coastal crossing." Authorities have urged north Queensland residents to stay calm and listen to safety advice as the storm moves in. Residents in the cyclone danger zone have been told to turn off their electricity and gas, unplug appliances and fill bathtubs with water. Queensland Emergency Services Minister Neil Roberts says mattresses and pillows should be kept close by. "Often the safest place for people is in the smallest room in the home - that might be the laundry or the bathroom," he said. He says history shows storm surges from severe cyclones can be deadly. "Most lives were lost through storm surges - not through the wind of a cyclone," he said. Emergency Management Queensland says a storm surge that inundated parts of Mackay in 1918 killed 13 people. Main Roads Minister Craig Wallace has warned people in the cyclone danger zone to stay off the roads. "We need to make sure our roads are clear for evacuees, police, road crews and emergency vehicles - I can't make it any clearer," he said. "If you don't need to be out on our roads, stay home and stay safe." Almost one-third of Townsville's population has been told to evacuate and residents are being warned to expect destructive winds by this afternoon. Around 60,000 thousand residents in Townsville have been told to leave by lunchtime. Thousands of travellers have left Cairns and Hamilton Island on extra flights provided overnight. The Cairns airport is due to close later this morning. The Townsville aiport will close its passenger terminal at 10am (AEST). However, the runway in Townsville will remain open for defence and emergency services. Authorities, assisted by the military, carried out forced evacuations overnight across low-lying areas of Townsville, Cairns and the Cassowary Coast. Tens of thousands of people in north Queensland began fleeing their homes yesterday. Residents in low-lying parts of Cairns and Townsville were told to move to higher ground and patients from two Cairns hospitals were flown to Brisbane overnight. Authorities say people should leave for higher ground or seek shelter at evacuation centres, which opened at 6am in Cairns today. People who have to leave their homes and have nowhere to go should call 1300 99 31 91 for help finding emergency accommodation. Ms Bligh ordered mandatory evacuations yesterday after lengthy discussions with the Townsville City Council about the threat from a cyclonic storm surge. Warning Signal before broadcasting the following warning. moving west southwest at 29 kilometres per hour. POSES AN EXTREMELY SERIOUS THREAT TO LIFE AND PROPERTY WITHIN THE WARNING AREA. direction and is expected to cross the coast near Innisfail close to midnight. low lying areas in remaining warning areas to the south of Ayr. 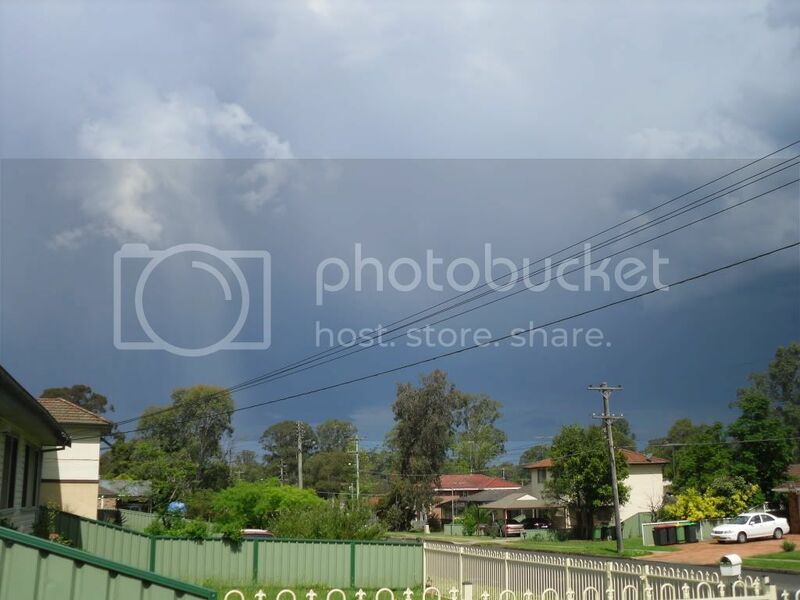 the north of the cyclone and affect the Atherton Tablelands. WINDS are likely to experience these conditions for about 3 to 4 hours. interior overnight and west to Mt Isa during Thursday. morning as the cyclone moves inland. preparations quickly and be prepared to shelter in a safe place. The next advice will be issued by 8:00 pm EST Wednesday 02 February. smee - I couldn't agree more! Dunk Island, Mission Beach and Bingil Bay are about to have a few moments of peace... the eye of Yasi has arrived there!! 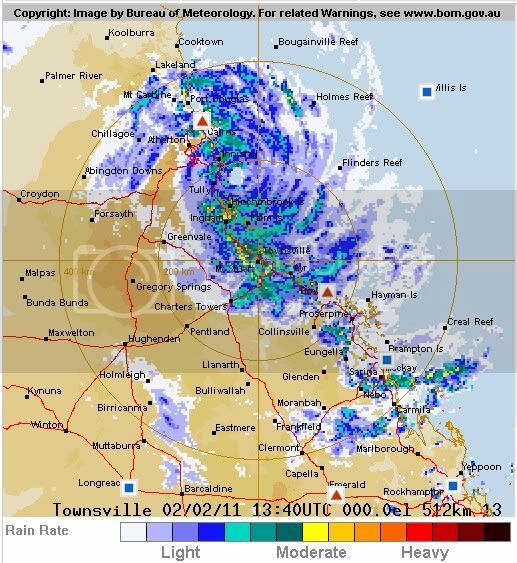 Townsville is copping it - while Dunk Island is basking in the peace of the eye ... for the moment! 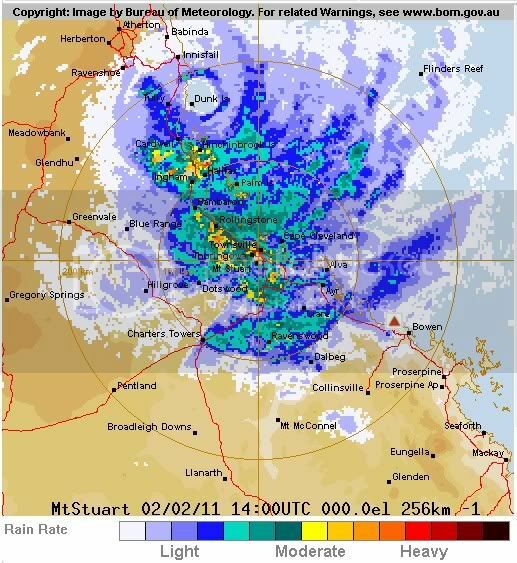 NOTE: This image is from the 'Townsville only' radar - distant details (like around Dunk Island) aren't picked up very well - so don't think it's all quiet past there!! The Bureau of Meteorology has a 'composite' radar image which adds radar images from different radars to give a more accurate overall picture. Images at the 512km range are these 'composite' pictures. For people in the Inner, Eastern, Mornington Peninsula, Western Port and parts of the South East, Northern, Western and Outer East Local Warning Areas. Issued at 10:40 pm Friday, 4 February 2011. The Bureau of Meteorology warns that, at 10:35 pm, severe thunderstorms were detected on weather radar near Craigieburn, Sydenham, Sorrento, the area northeast of Ballarat, Croydon and Mornington. These thunderstorms are moving towards the east to southeast. They are forecast to affect Footscray, Greensborough, Melbourne City, Preston and St Albans by 11:05 pm and Caulfield, Dandenong, Glen Waverley, Melton, Ringwood and Sunbury by 11:35 pm. Very heavy rain and flash flooding are likely with the storms. Damaging winds are also possible and there is also a chance of large hail. Severe drought in my backyard. strewth, Ballarat copped it a beauty. Nearly 60 MM rain in 2 hours and flash flooding everywhere. hello me moonie, is it only 17 deg at your place right now? Bit chilly here today, may need to put a jumper on soon. Brrr, got my jumper and slippers on now. yep and by the look of it, coming to a town in Vic, near you wheels. I think instead of slippers, you might need flippers instead, lol. and please send some of that cool air up this way. 18.9? sheesh. it ain't fair! Here is the real-time image of radar + satellite (the above is a snap shot of the radar component only). 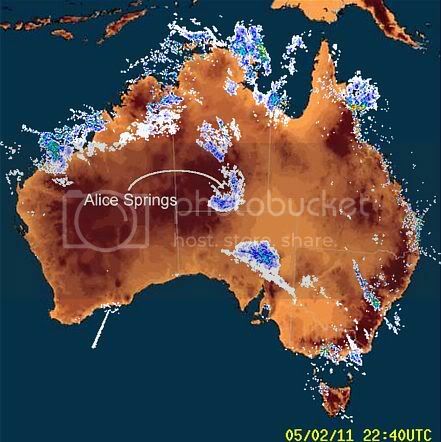 will all that storm activity change the appearance of Uluru ? I captured some frames and made a GIF - for posterity. This won't change. A bushfire still burning out of control in the Perth hills has destroyed 41 properties and damaged a further 19, fire authorities say. Fire and Emergency Services Authority (FESA) Chief Operations Officer Craig Hynes said all of the losses were reported in the Roleystone area, while surveys had not yet revealed any significant damage associated with a second bushfire raging in the Red Hill area. The bushfire emergency warning remains in place for people in the south-western part of Roleystone and south-eastern part of Kelmscott in the City of Armadale, as well as Baskerville, Millendon, Herne Hill and Red Hill in the City of Swan. "We're still calling both fires uncontrolled and we won't be able to let people back into the areas due to safety reasons," Mr Hynes told reporters on Monday. "We are very concerned about the safety of the firegrounds and we are doing our best to make sure that there are no injuries. Life is our priority. "Unfortunately it appears we have lost 41 houses at his stage totally, and 19 partially damaged. Mr Hynes said surveys were still being conducted by specialist damage assessment teams at the Roleystone incident. "At the Red Hill incident there are some partial releases at the fireground to let some people back in," he said. "We've still not reported any losses at that fire and the pleasing thing is that there has been no serious injuries or fatalities." One volunteer firefighter remains in a stable condition after being admitted to Armadale Hospital on Sunday after being injured while trying to save properties. Some people have also taken themselves to hospital for treatment of smoke inhalation. Around 200 firefighters are battling the Roleystone blaze with resources from around the state and Victoria being called in, or already deployed. While crews are "stretched", Mr Hynes said conditions are expected to begin to ease from around midday (WST) on Monday. Police officers and firefighters are expected to be among those whose homes had been destroyed or damaged, he added. FESA was warned by the Bureau of Meteorology to expect "remarkable winds" over the weekend, and had prepared for the extreme conditions. "We weren't surprised that the wind strengths were gusting at up to 75km/h. Last night we got a little bit of a reprieve, they probably peaked at around 50 to 60 (km/h)," Mr Hynes said. "We are expecting those winds to ease at around 12 o'clock today." Mr Hynes said the containment efforts overnight were good, but the easterly winds will remain of concern. "The fire conditions are not remarkable this week ... but we're not going to be complacent," he said. It WAS there earlier Smee, I read it. From memory, the warning was for central Victoria, south of Bendigo and referred you to the BOM website. I had never really expected that we'd not ever have a severe fire danger to face again... *sigh* so this is not unexpected, simply disturbing. Please, everyone - be careful. Stay cool, avoid unnecessary travel, maintain high awareness and let's hope there's no maniac running around with matches. AUSTRALIA is in the grip of an extreme heatwave with temperatures soaring past 40 degrees today - and the hot air will affect more of the country over the next week. 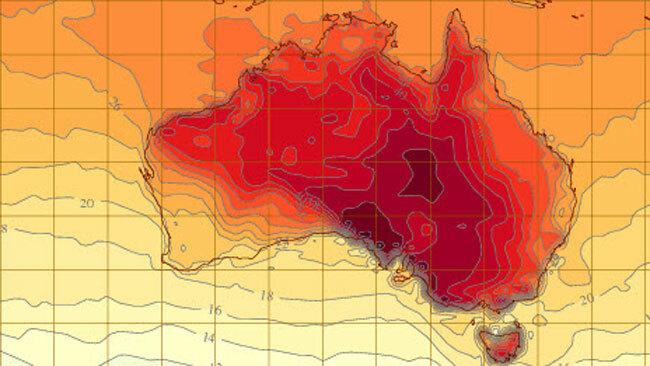 A "superheated" air mass flowing from the deserts of central Australia will push temperatures well above 40C across huge areas of Queensland, South Australia, Victoria, New South Wales and the Northern Territory into next week. The Bureau of Meteorology's Assistant Weather Service Director Alasdair Hainsworth said we can expect to see a change late on Friday with temporary relief on Saturday, before the heatwave continues next week. Bushfires tearing through NSW areas (including the Blue Mountains). Hundreds of homes may have been lost after New South Wales suffered one of its worst bushfire days in recent memory on Thursday. Intense fires tore across south-eastern Australia in ferocious wind conditions and high temperatures, darkening Sydney's skies with smoke and ash. Thousands of people have been evacuated as emergency warnings are in place for bushfires burning out of control near Lithgow and Springwood in the Blue Mountains, and Heatherbrae near Newcastle. Temperatures hit the mid-30s and wind gusts reached 90kph throughout the day. "We are unclear yet as to how many properties have been lost, but it's expected by the time we finish counting, it will be at least in the hundreds," New South Wales Premier Barry O'Farrell said. "It will take some days to see the end of these fires and I suspect if we get through that without the loss of life, we should thank God for miracles." At one point 95 fires were being tackled across the state, with dozens out of control. Total fire bans were in place for areas including Greater Sydney, as well as the Central Ranges, North Coast and North Western districts. Our hearts go out to all those affected. Please - evacuate BEFORE it gets to crisis point. Get to safety if you have even the slightest suspicion of being in danger. If you receive the emergency warning on your phone, on the news, on the radio, by SMS, or any other means - act. Please do act. May you be safe and may the fires die down as quickly as possible. Our hopes, hearts and prayers go out to all those affected by the fires in NSW; in particular, the huge stretches of furious flames blazing across the Blue Mountains. 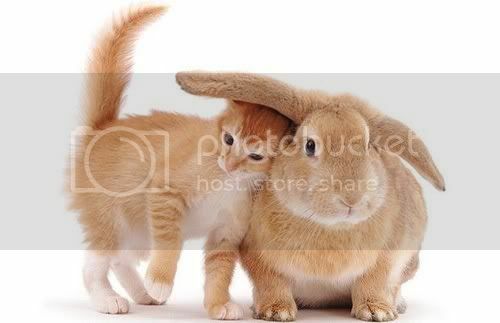 May tomorrow not bring disaster with it. The 2015 El Niño is now the strongest El Niño since 1997–98. The tropical Pacific Ocean and atmosphere are fully coupled, with sea surface temperatures well above El Niño thresholds, consistently weak trade winds, and a strongly negative Southern Oscillation Index. Weekly tropical Pacific Ocean temperature anomalies (i.e. difference from normal) in the central Pacific are now at their highest values since 1997–98, though still remain more than half a degree below the peak observed during 1997–98. Most international climate models surveyed by the Bureau of Meteorology indicate the tropical Pacific will continue to warm, with the largest anomalies occurring later in the year. Typically, El Niño peaks during the late austral spring or early summer, and weakens during late summer to autumn. The 2015 event has, so far, been following a normal El Niño life cycle. While the Indian Ocean as a whole has been at near-record temperatures, the Indian Ocean Dipole (IOD) index has been at or above +0.4 °C for the past four weeks. To be considered a positive event, the IOD would need to remain at or above +0.4 °C through September. Three of the five international models surveyed by the Bureau of Meteorology indicate a positive IOD event is likely during spring. El Niño is usually associated with below-average winter–spring rainfall over eastern Australia, and a positive IOD typically reinforces this pattern over central and southeast Australia. However, sea surface temperatures to the north of Australia and more broadly across the Indian Ocean basin, also affect Australia's climate and are likely to be moderating the influence of these two climate drivers in some locations.